So.... it's been awhile. I mentioned it on Instagram, but I got overwhelmed with work and then trying to do Blogmas that I had to stop. I was really motivated to do it and then I started to lose some sleep. I also felt like the quality of my posts wasn't as high as I wanted to be and so I started to get upset about that as well. I'm going to go more into it on another post, but just wanted to say Whoops and that I tried! Also wanted to say Merry Christmas!! Now, this post is going to be about the Too Cool For School Artify After School BB Foundation Lunch Box SPF37 PA++ in Healthy Skin #30! 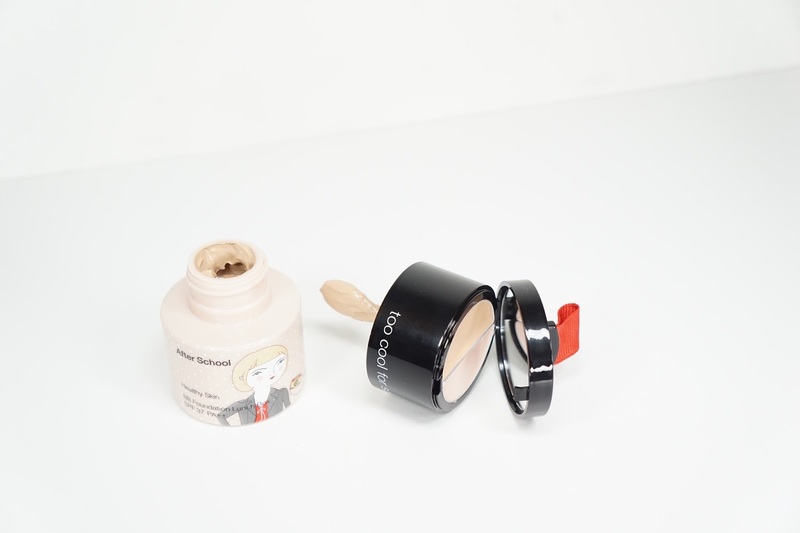 It includes a BB Cream, concealer, and cream highlighter all in one! This product was one of the few bases that actually had a shade close to my actual skin tone and that was the biggest reason on why I wanted to try this out. I can't seem to find details on how much product there is for the concealer and highlighter, but I believe there's 40 mL of the BB Cream and this 3-in-1 retails for around $17 depending on where you buy it from. Going to start off with the biggest con - I'm not sure how I feel about the applicator for the BB Cream. It's a spatula, but it is short with a small opening. I'm worried about it running out, but I'm also thinking about how I rarely finish a foundation/BB Cream. It's also hard to control how much product I use each time. and now onto all the Pros! I'm actually very happy with the color match. If anything, it does initially look a bit gray and could be a tiny bit darker. I was able to get a pretty good solid medium coverage with a brush and then a light-medium coverage with a sponge with one layer using both methods. I do prefer a dampened sponge though since this method does allow for more layering to give me even more coverage. 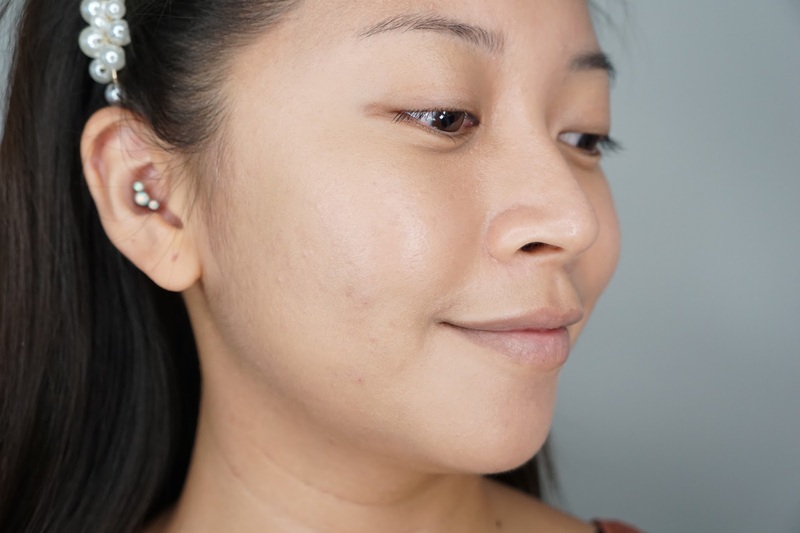 I waited too long after applying moisturizer to do these product shots and so I did see some more texture emphasis around my cheeks (my drier spots), but this BB Cream does sit and apply on my skin pretty well. The finish is also a very naturally dewy look that just looks healthy. I can see a wide range of skin types using it and still working on their skin! On the other hand, the concealer felt drier and so I felt like it emphasized any lines and dryness that I have on my skin. It felt thick compared to my recent favorite concealer (Glossier Stretch Concealer), but it is pigmented. I personally don't like this because I have such a dry under eye area though and it also didn't sit that well on my acne marks. Left side has concealer and the right side is just with some of the BB Cream. 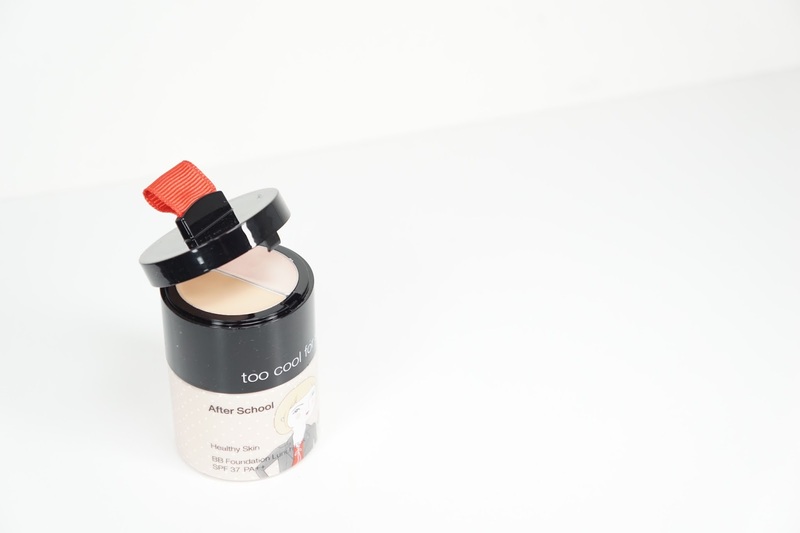 The highlighter was interesting because it has a thinner texture than the concealer with more of a slip and almost felt like it set to a powder finish. It's not as obvious in the above pictures, but even though it looks only pinky in the pan, it is a pale pink based highlighter with some subtle golden shimmer. The effect is very subtle and almost too subtle for my tastes, but it does add a bit more definition to my face without going overboard. I can see this working really well for those who love strobing though. It didn't emphasize the texture I have on my skin either and really worked wonderfully with the BB Cream. Final thoughts: As a whole set, I'm enjoying the Too Cool For School Artify After School BB Foundation Lunch Box so much! 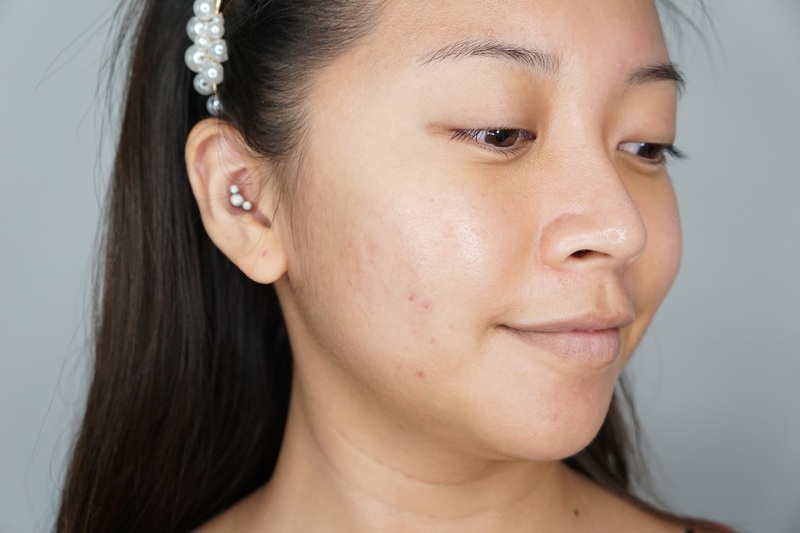 I love the BB Cream so much since it's the perfect amount of coverage for my current skin situation and the finish is beautiful on my dry skin. 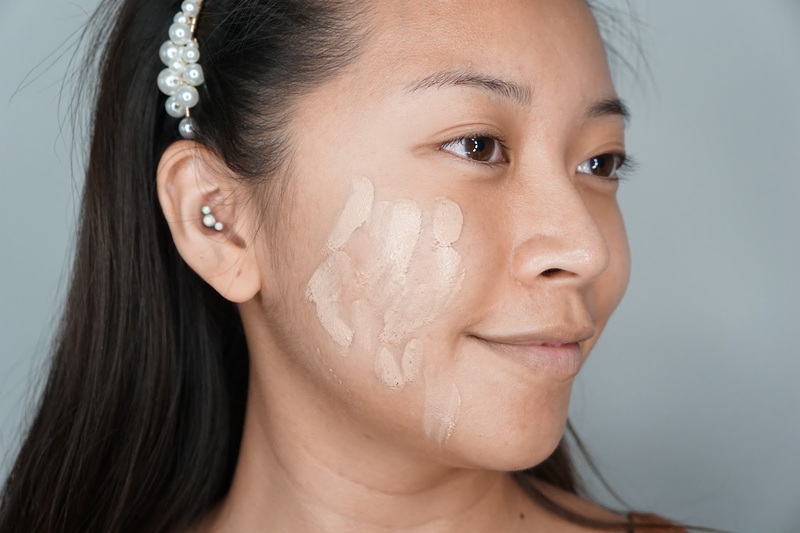 While the highlighter is subtle, it looks so nice when it catches the light because there's a nice glow without obvious shimmer or added texture. I could've done without the concealer though because it just didn't work for me. It might work for those with more oily skin though because it just felt too dry for me. It is unfortunate that this product (and most Asian base products) has a very very limited color selection. It's such a handy 3-in-1 that I feel like it could be very popular if it came in more shades. Have you tried this product before? 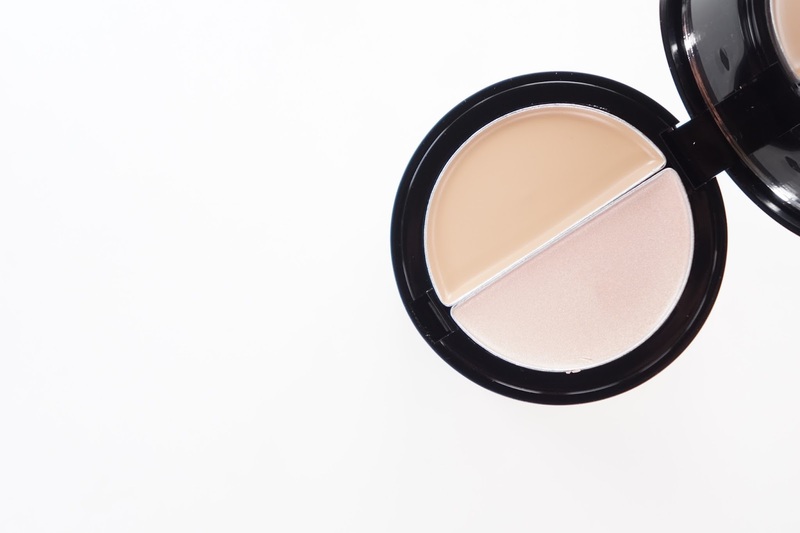 What kind of foundation/BB Cream/base do you prefer?